Helps contain snow, water, and ice. Description - The diamond plate design is one of the best floor tile patterns available and our most popular pattern for use as a garage flooring. It not only has tough appearance for use in heavy duty commercial / industrial / work shop settings, it also provides for a non slip surface in case the flooring is spilled on and/or gets wet by water, oil, or other liquids. Cutting of these tiles to custom fit them to your room can be easily done with a fresh utility knife and straight edge like a yard stick or ruler. Note: Flex tile colors are produced in batches, which can lead to color variations in your order. All colors may present some color variation, but Black, Dark Grey and Light Grey can produce the most. These three colors can vary greatly between batches and thus it is recommended that you order more flooring than is needed for mistakes and replacements. This in turn gives you the greatest chance to keep continuity across your floor. Batching will also affect color variation between samples and your order with Black, Dark Grey and Light Grey showing the most variation. Material – Constructed entirely of a proprietary and durable blend of flexible virgin PVC. This blend ensures that the tiles are flexible and have the anti fatigue qualities similar to rubber flooring but also the durability, long life, and chemical resistance associated with polyvinyl chloride. Recommended Uses – Diamond plate tiles are truly a multiuse tile option. These tiles are most often used as garage floor tiles but have been used successfully in gyms, workout rooms, tool sheds, as trade show flooring, auto dealership show rooms, retail stores, and auto show display floors. Vacuuming or sweeping any loose crumbs, dust, or debris from the tiles when necessary. Periodic damp mopping of the floor tiles with a mild soap and water mixture. Some soaps commonly used include Dawn dish detergent and/or Tide laundry detergent. Note: This is not a stain proof product. Street tar can cause staining to light colored tiles and in most instances this staining can be remedied with a cleaner called Purple Power. If you have performance tires, staining can occur with light colored tiles. In most instances this may not be remedied with a cleaner. If the staining on your floor does not dissipate, please contact our dedicated Customer Service team at 866-416-6388 who can further assist you. Stain resistant and odor free. 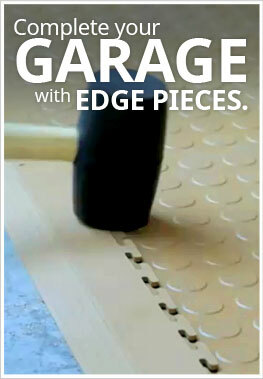 I am planning to use your Diamond Flex Tiles to cover a basement/garage floor that is approximately 820 square feet. How much extra should I order to account for cutting/waste? We always recommend at least 5% overage for any space to account for any cuts, waste, or mistakes. Are these tiles uv resistant? My garage opens to the west and gets a lot of afternoon sun. Our Diamond Flex tiles are UV resistant. In direct sunlight they will fade. I am in Arizona, how does your garage tiles hold up to extreme heat? Will my vehicle's tires stick to tiles? Our Diamond Flex Tiles have been installed all over the country from the coldest parts of the North Dakota to the hottest parts here in Arizona. These tiles hold up very well in all climate types and will not get brittle in extreme cold or melt in extreme heat. These tiles are made from the same material that your water pipes in your home are made of, PVC. In extreme heat, your tires will not stick to the tiles. These tiles are made to expand and contract with the outside temperature. So, in extreme heat situations, your tiles will expand a bit. In extreme cold, they will contract. After 2nd flooded basement, I'm considering you product. Is this something that if I flood again, i could lift up and dry them out to relay them? These tiles are easily interlock and are modular. You can pick these up, let them dry and reinstall with no issues. I live in the Northeast. How do the Flex Tiles hold up during winter with road salt dripping from the car? Does the salt affect the tiles? Which tile might be the best option to withstand winter salt and chemicals used on roads. Salt and other road products will not affect our Diamond Flex Tiles. These tiles are resistant to most household and vehicle chemicals and are also resistant to most road additives. There are only two things that will affect these tiles. Tar can stain these tiles, but that can be cleaned off the tiles with a product called Purple Power. The other thing that can affect the tiles is high-performance tires. The only solution to fix the staining from these tires is to get black tiles in the area where the car will be parked. I installed the Diamond Flex Tiles in my two car garage. It took about 6 hours and I did not have any help. Most of the time was taken up doing the area around the water heater and air handler. It looks better than the pictures in your web site. It was the best thing I have done as a home improvement to your home. Many others have looked at it and have stated how great it looks. I have had my floor down in my garage for 5 years and have found--in response to the comment about the difficulty cleaning--that a Mr. Clean Magic Eraser will take up any dirt and stains.